I love bell peppers. I have tried growing them in the summer time with some success. And I do not have a green thumb, so they are hardy plants! The fresh taste of bell pepper strips are so good alone, on sandwiches, or with a platter of veggies and dip. I also enjoy the taste of the peppers when roasted. They are a snap to roast too. In a pinch, though, roasted peppers from the jar work in some recipes. I have been craving roasted red peppers, trying to figure out how I wanted to prepare some. Since the chill of fall is in the air, I also wanted comfort food…in the form of pasta. How could I use those 2 things together to satisfy my craving? I decided to make roasted red pepper pasta sauce. I threw in some grilled chicken too, and that added to the warm smokiness of the dish. This time of year bell peppers are pretty expensive, and not all that beautiful, at least at the east coast markets. Taking that into account, I chose to use roasted red peppers from the jar for my pasta sauce. I tossed a recipe together that ended up being delicious. A very nice change from the typical pasta sauce that had a good nutritional value. Bell peppers, with their vibrant colors, are good for you. They are low in sodium and cholesterol. They are an excellent source of vitamins A, K, C, B6, potassium and fiber. The pigment in colored bell peppers are a fantastic antioxidant, which may help protect our cells from damage. Bonus! Yay! That keeps our bodies in better shape, is great for our skin, and may even help hold off on some of those dreaded wrinkles! It is a win win situation. So let me share my recipe with you. 2-3 green onions, chopped. Include the green tops too! Pinch of red pepper flakes to taste-I used about 1/4 teaspoon. Heat the olive oil and melt the butter in large pot. Add the onions and garlic. Saute for 3-4 minutes. Add the roasted red peppers. Turn the heat to low, and simmer for 20 minutes, stirring frequently. Pour mixture into blender, being careful of the hot mixture, and blend until smooth. Add back to the pot, and add the vegetable stock, red pepper flakes, basil and salt. Heat. Stir the flour into the cream with a fork, and slowly whisk mixture into the to red pepper sauce. Heat and let simmer for another 20 minutes. In the meantime, heat water for pasta and cook. Mix pasta and sauce together, and enjoy! As I said, I added some diced grilled chicken to the sauce and it was delicious, but this sauce can certainly stand on its own. It is a delicious vegetarian dish. I also had cooked broccoli with lemon, and some crusty french bread to round this meal out. It was a good meal for a cool evening, easy to prepare, and packed with flavor. The plate was beautiful, something I always consider when plating a meal. I don’t want to serve baked chicken, cauliflower and mashed potatoes. Boring! A plate should look appetizing, and the colors should be a vibrant as possible. The red pepper pasta, broccoli and rich bread made for a pretty presentation. Bon appetite! In this country, restaurants have a tendency to take an ethnic theme or food and put a twist on it. It is the mark of a great chef. Taking command of flavors and textures to make a dish outstanding takes what I call the “3 T’s”, training, tasting, and talent. A wonderfully inspired chef takes our palate to new heights when dining out. I do that when I am cooking at home too. I love to take a recipe and make it mine by adding a secret ingredient that is unique to my recipes and palate. I generally use recipes to understand the construction of the dish more than anything. I adjust the recipe to fit what I have on hand, time allotment, and what my family likes. I am sure that restaurant chefs do the same thing in developing a signature dish or a special menu. But I think some restaurants have gone a little overboard with adding cheese to most every dish on the menu. One television commercial stands out in my mind for showing every single entree oozing with cheese. We love dairy, and cheese in particular. By some estimates, americans eat 632 pounds of dairy a year. Cheese is fabulous when paired with fruit and even a great glass of wine. But at many restaurants serving mexican food, there seems to be cheese on most everything. Food inspired by our south of the border neighbors can be loaded with amazing seasonings, peppers, flavors and textures not used in typical “american fare”. Why cover all of that up with cheese? I recently ate at a mexican restaurant, and finding an entrée without cheese was my goal. Now I have to admit to cheese being a guilty pleasure of mine, and my particular quirk with cheese is that I like some cheese, like cheddar, burned. I know…weird, right? But sometimes I feel like I need to clean up my act a bit and try to go on a “cheeseless” binge. This was one such night. I wanted to taste the purity of the mexican spices, preparation methods, and textures. It took a bit of digging through the menu, but I found it. I ordered steak. It came smothered with chunks of onions and was wonderfully seasoned. Rice and beans rounded out my plate. It was fabulous! No cheese…but loads of flavor! The most delightful part of this dish had to have been the “salad” that came with my steak. A separate plate was served with my main dish. 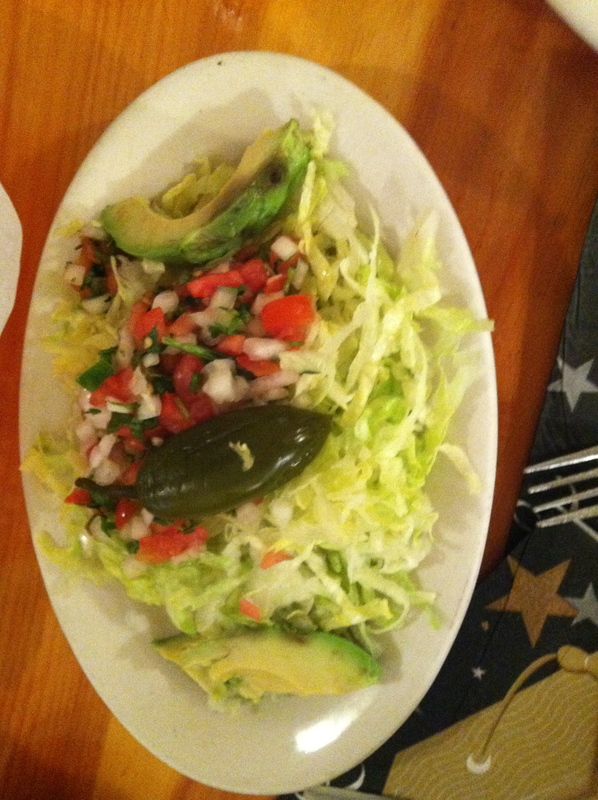 It was piled high with lettuce, avocado, jalapeno pepper and fresh chunky salsa. Savory cilantro capped off the seasoning to this side salad . It was a tasty surprise, so fresh, and really packed with texture and flavor. The colors were very appetizing, and I could not wait to dig in! The evening at the Mexican restaurant was to honor my oldest son’s graduation. The celebratory dinner with family and friends was filled with joy and fun. And the food was over the top delicious. I did not have cheese that evening, and I truly did not miss it. The flavors and aromas of the food placed before me made my mouth water from the get go. After digging in, the dish did not disappoint. It was fabulous. So try it, go for it. Look for a good solid mexican meal without cheese. Enjoy the purity of the flavors. It will be worth leaving the cheese off for the night! Feast your eyes on the picture below of my “side salad”. Now aren’t you getting hungry? The "side salad" with my mexican steak! Fresh and delicious! I have never been a huge meatball fan. I really didn’t have them growing up, and it just seemed easier to make a meat sauce with ground beef rather than the extra step of making meatballs. And a meat sauce is a better way to stretch food dollars, so I had another good reason to make meat sauce instead of meatballs and marinara. I have nothing against meatballs, I just didn’t usually have the time to make and cook the meatballs. But fall is here, and comfort food is front and center. So is being versatile with 1 food item. So I made meatballs! I had been asking my friends about meatball recipes. If I was going to jump into this pond, I wanted a real whiz bang recipe. The meatball had to be worth the effort! I had a pretty good idea what the recipe would be like, but wanted to hear others “secrets” to this dish. I heard lots of great information, and also peeked at some recipes in some cookbooks. Not only did I think about the ingredients, I learned about how to cook meatballs. The cooking methods ranged from baking to frying to throwing them into marinara raw and letting them cook for hours. I took all the pointers and let it simmer in my own creative juices for a bit. Then I went about creating my own fabulous meatball! This is what turned up. Mix all ingredients together. (I really dug in and mixed this up with my bare hands. Just squashed everything together). Shape the meat mixture into little 1 inch balls and baked them at 350 degrees for about 30 minutes. For the bread crumbs, I used my moms trick. I took some saltines as well as a few buttery crackers, crumbled them, and used that as my bread crumb mixture. While I keep bread crumbs and Panko (light Japanese bread crumbs) in the pantry, sometimes I like to use the cracker trick. It adds a little more flavor if you have an extra minute or two to do it. And remember, when in the kitchen and cooking, wash your hands often. My youngest son had friends over when I created this recipe and I decided to veer away from the typical spaghetti with meatballs. I made meatball subs for them instead. I had made some marinara sauce earlier that was simmering on the stove, sending delicious aromas wafting through my home. To make the sandwich, and I made many, I took a hogie roll, toasted it, and layered some meatballs on it. I covered that with mozzarella cheese and put it under the broiler. When it was hot and gooey, I slathered the sandwich with piping hot marinara and put the top of the roll on. Well, when those sandwiches hit the table of boys, silence ensued. Chewing noises replaced talk of the latest football game. Delight! This is one of the things I love about cooking…creating. I guess that is where cake decorating comes in with baking. Baking, to me, is chemistry, an exact science. I like to feel my food, change my recipes, and play with ingredients. I can’t do that while baking. I am sure that great bakers can, but I am missing that gene in my gene pool. But cooking brings out my creativity, and I hope that this meatball recipe gets you started in that direction. I am a new meatball fan, and hope you become one too! These days, not only do we need to stretch our food dollars, we need to get creative with what is in the pantry. I have shared my award winning (in my own mind anyway!) recipe for pesto. I always have the ingredients to make it on hand, and you can do anything with it! And here is the best part…its inexpensive to make and keep around. You can make a huge batch and freeze it too, making it even more versatile!! This pesto can be used a million different ways, and its packed with flavor. Place all ingredients in a food processor or blender. Blend until smooth. Feel free to add more olive oil to taste or desired consistency. I have used dry parsley and basil in a pinch. If you so that, scale the amount of basil and parsley down by half but keep everything else the same. I have been known to be heavy handed with the fresh parmesan cheese. Also, I have used walnuts instead of pine nuts. They are flavorful and more affordable than the pine nuts, and I always have them in the pantry. Adjust this to your taste and have fun! Now how to use this sauce. The options are endless! Mix pesto with some mayonnaise, and use as a condiment on sandwiches. Slather it on some good french bread, layer good turkey and swiss cheese on that, and add some roasted red peppers and arugula. It is an amazing gourmet sandwich, and so simple! Now freeze the rest of the pesto. If, when you pull it out of the freezer to use it seems too thick, just drizzle some high quality olive oil in, and enjoy. The pesto is a beautiful vibrant green color with flecks of brown. Gorgeous! It looks so tasty and appetizing any way it is served. If you want a hint to a fourth way to use this fabulous pesto…I can give you yet another one. This one is newly discovered. Just figured it out! I made this pesto tonight. A big batch to last a while. Two of my children had some friends over (who always appear when I cook, much to my delight!) and as I finished the pesto they grabbed some crusty bread that was sitting on my counter. That bread got ripped up and dipped into this pesto almost before I was done blending it! The children (and by children I mean teenagers who are always foraging for food and never full…) simply could not resist the aromas floating around, and had to dig in. I can report, with some satisfaction, that eye rolling and taste bud satisfying moans followed the taste of the pesto and bread. That is a testament to the fabulous flavors of this recipe. There is no bigger compliment than to have folks dig into your food fast, succumbing to the delicious scents wafting throughout the house. Except, of course, a good solid burp. But after snacking on this pesto and the bread, the belching cannot be far behind! So go ahead, make this recipe. Use it 3 ways….and many more! I value wellness, nutrition, and a healthy life style and love to read articles relating to these topics. Wellness relates to the whole person, mind, body and soul. We need to keep our mind sharp by reading and challenging our brain. We keep our body in tip top shape by eating well and keeping active. And we keep our soul in good shape with faith, relationships, humility and gratitude. Lifestyle combines a balance of these core wellness values. It is important to stay healthy inside and out. I have read many conflicting articles about children, parenthood, marriage, and how these relationships relate to wellness via a “happiness meter” if you will. Some articles tout their supporting documentation saying that married people are more satisfied with life than single people. Whatever that means. Then there are the folks that state parenthood increases stress and shortens life span, so if you want a long happy life, don’t have children. I say phooey to that! Stress in motherhood? You bet! Loads of it. I do not deny that. But love and happiness, for me at least, has grown exponentially with becoming a mother. Some folks swear being childless is the way to go. And for them, I am sure it is. But you certainly can’t impose those feelings and life experiences on everybody. And who established this so called measure of life perfection and satisfaction? I look at these articles and the silly happiness meters and say bull hockey (or as my high school algebra teacher would say Bull Roar)! Life is what you make of it! Being the youngest of five children, I was an aunt long before I ever considered being a mother. And those children certainly seemed to add to every one’s happiness in my family. I did not see the ol’ happiness meter tanking as my family filled up with the next generation. As for myself, my “happiness meter” is off the charts since becoming a mother! And the happiness continues every day. Could this really be shortening my life span? I walked into a community dedication service last night. My teenaged daughter was on the committee putting this magnificent program together. She wanted me to come to the service that she had worked so hard on. And of course I went. After all, how could I turn down a reserved seat at a sold out event that my smart beautiful daughter had a hand in creating? I entered the building where the service was taking place. My daughter met me at the door with her big bright smile and grabbed my hand. I planted a big fat lipstick kiss on her cheek, and she didn’t even get mad! She led me through the crowd, up to the front, and plopped me in my seat. My daughter had chosen a seat for me where I was surrounded by friends. Not just my friends, but our friends. Young and old alike. Perfect! She then went about the rest of her duties, making certain that the seat to my right was reserved for her. When the service began, she took her place next to me. And the community event was a success. She said that she was glad that, even though there was a lot of hard work involved, she participated in planning the event. My daughter said that she learned quite a bit in the process, including some new time management skills. But I learned even more! I learned, from listening to my heart, how much I love being a mother. How there is no feeling in the world like seeing your children do something good. Pride swells up, even from just looking at my child. I learned that my high school aged daughter is amazingly capable of handling herself in the community. I learned that I made the right decision for myself in becoming a mother. And with being in the thick of things with the hard work of raising my three children, I am learning to appreciate my own mother more every day. Even as an adult, I am blessed to have my mom one phone call away to comfort me, listen to me, encourage me, and love me unconditionally. Have I contributed to her shortened life span? Made her “happiness meter” falter? Yikes..what a morbid thought. But she is in her 70’s and been married for 55 plus years, so she would probably say her meter is just fine. Motherhood is not for the faint of heart. And certainly there are many great women that choose not to have children and make incredible contributions to society as well as many great mothers that do the same. Motherhood. like faith, is an intensely personal decision. The happiness of becoming a mother also comes tremendous heart break as well. A part of your heart no longer belongs to you, and someone else controls it. Your child. But sometimes its exciting lose control…. Beef stroganoff was not on my regular family meal rotation growing up. My dad did not like noodles, so unless he was out of town, we really didn’t do much pasta. Not to say that our meals weren’t always fabulous, because they were. We were a meat and potatoes, 50’s style. there was truly an art to doing that well. And no one did it better than my wonderful mom. Could she stretch a dollar with 5 kids to feed! I am sure that was a lesson that she passed along to me without realizing it. I can do anything on a budget! That is what this stroganoff recipe is all about. And we all need a recipe here or there that we can do on a budget and maximize our food dollars. The beef stroganoff recipe that I have and am about to share is good, feeds a crowd, and is affordable. Serve it with some whole wheat dinner rolls and some delicious green beans, and its dinner in a snap. Traditionally stroganoff uses beef roast of some sort, but I just use ground beef. salt and pepper to taste-I usually use about a teaspoon of each. Brown grown beef in a large skillet and drain fat. Add bouillon, cream of mushroom soup, can of water and mushrooms. Bring to a simmer (light boil) and simmer for 10 minutes. Add sour cream and noodles. Allow simmering to continue, and stir every few minutes. Cook until noodles are done, about another 10 minutes. This is a good recipe for the children. You can also add 1/4 cup of chopped onions if preferred. Add it while browning the ground beef so they cook and get tender. This is a super easy recipe to customize. For example, if you want to add more mushrooms, or add fresh instead of canned, go ahead. Customize it! The weather is turning to fall, cooling down, and now is the time to cook some comfort food. Try this recipe, customize it to your taste, and enjoy. We have all been around those folks. You know the ones. When it is dessert time, they say “Oh I never eat dessert”. I usually only dine with those folks once. No dessert? That is crazy talk! Dessert need not be a huge part of the meal, but dessert we must! Dessert began as a luxury, for sure. It still is considered so by many. Dessert was first enjoyed in ancient times in the form of fruit or nuts with a little honey. A precursor to the modern day candy bar perhaps. Dessert has been around for many centuries. Many believe that the word and custom hail from the french word “desservier”, meaning to clear the plates. So at the end of the meal when this occurred, dessert was served! Meals can be brought forth in courses. In different cultures and countries, the “order” of the courses can vary. Salad first or last depends on the country you are in and the culture reflected. Sometimes, as with fine dining, a palate cleanser is served between courses. This is usually something cold, with a delicate fruit overtone. Such as a lemon sorbet. This is a beautiful palate refresher so the next course is met with a fresh mouth. But dessert, in cultures that welcome it, is always served last. It leaves the palate with a sweet ending. Modern desserts can range from a cookie to a piece of fruit pie to a dish of ice cream. And when we think of dessert, we usually think of it as an after supper treat in the evening. A sweet nibble is nice during the afternoon, but dessert does not usually follow breakfast or lunch. Only our big evening meal. I happen to love desserts. I have to admit, though, I like it a little after my meal. My children and dinner companions take part in after dinner clean up, but lets face it. The brunt of the work falls onto my shoulders. So after my dishes are done, the table wiped down, leftovers put away and lunches for the next day made, I like to plop onto my bootay for a bit. Put my feet up. And that is when I most enjoy dessert on a busy weeknight! It need not be fancy. A bowl of ice cream is creamy, refreshing, and not too sweet. A cookie provides just the right crunch. A little piece of cake is delish! When out at a restaurant, however, I like to have a dessert that I would never make on my own. That is when I go big. A richly flavored custard, perhaps, or a mile high piece of decadent pie. And these desserts I usually prefer to share with a dining companion. Just a couple of bites can satisfy when it is a big dessert out. But at home it is a little more simple. And every bit at comforting! YUM!